Summary: If AMEX Centurion is too expensive, then the Visa Black Card is the best alternative. It has benefits that no other Visa card can match. Get the best and most prestigious card from Visa. 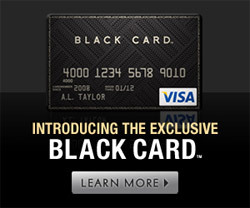 Introducing the Visa Black Card. It has features and benefits that no other Visa card can offer. It has an annual fee of $450 dollars which is the least expensive out of these type of elite credit cards. The Centurion by AMEX has an annual fee that is approximately $5000 which makes this Visa Black Card an ideal card to get.